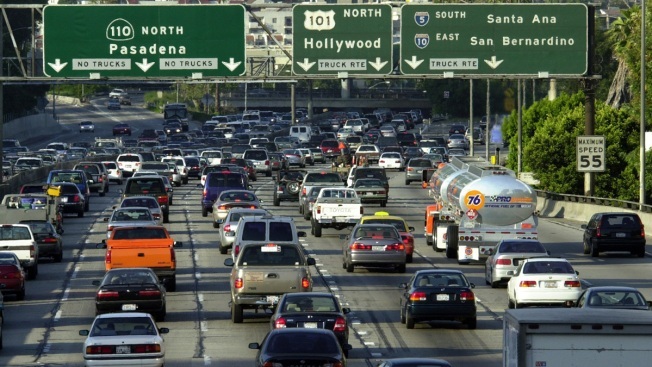 Traffic fills the 110 freeway during rush hour, May 7, 2001, in downtown Los Angeles, CA. Some advocates want New York City to implement congestion pricing on their roadways, NBC News reported. If implemented, drivers on some of the busiest roads in Manhattan during peak hours would have to pay a surcharge; roads that usually are free would become toll roads. The proven success of congestion pricing is why cities like New York, Los Angeles, Seattle and Boston — the eighth most congested city in the world — have all toyed with the idea. In New York, Governor Cuomo and New York City Mayor Bill de Blasio recently announced they want to implement the policy by 2020, and Seattle’s Mayor Jenny Durkan is seriously considering the policy.